This story is an improbable blend of contemporary romance and high fantasy. After throwing himself through a fold in time and space, Emile finds himself in Sunny’s garden in Northern Ontario. Sunny is quickly captivated by the unusual young man he finds sleeping in his shed and he has no idea that Emile is actually a dragon. I really liked both Emile and Sunny, but I’m still uncertain about the romance between Sunny and Emile. I couldn’t understand whether it begins as insta-love or a relationship of convenience. Emile’s stories of non-gendered dragons makes them seem like asexual creatures – but Emile seems sexual and male in human form. Emile’s complicated responses to human life and human technology are fantastic and I enjoyed Sunny and Daisy’s reactions to Emile’s more magical world. Sunny’s grief is the reason for his isolation but even though he talks about his feelings, this storyline is dropped a few times and it isn’t a consistent thread in the novel. The animals in this book are wonderful. I loved Fernforest and Glimmerleaf. The story is beautifully written and as always, I love Jaime Samms’ descriptions. There is a little bit too much telling as Emile explains his world to Sunny. There’s a hint of Handmaid’s Tale in the dragon’s social structure, which Emile rejects before joining the human world. The world building is possibly a little bit too complex for such a short story. There’s a whole lot going on in two separate dimensions and I’m not sure I completely followed the scenes when Emile and Sunny return to the dragon world. Dragon shifter stories have really become popular recently and after this one, I have to concede that they’re just not my thing. I think my brain is just unable to insert high fantasy characters into contemporary romance. I think Jaime Samms makes a brilliant effort here – but I found myself unable to believe in the world building around Emile’s character or his sudden appearance in Ontario. 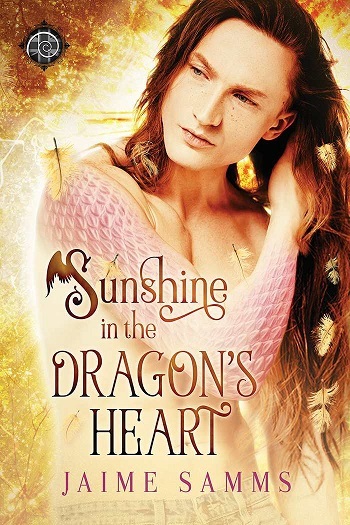 Reviewers on the Wicked Reads Review Team were provided a free copy of Sunshine in the Dragon's Heart by Jaime Samms to read and review.